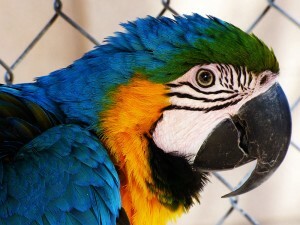 Parrots, also known as psittacines, are prized for their vividly colored feathers and intelligence. Even if born in captivity, parrots are considered wild and those traits are reflected in their habits. Their diets consist primarily of seeds, pellets, nuts, fruit, and vegetables. Some parrots can live 60 years or more – so acquiring parrots as pets can be considered a lifetime commitment. Parrots can continue to exhibit wild behavior if they are not properly cared for or if housed incorrectly. They may often exhibit antisocial and destructive behaviors. There are a number of reasons for re-homing parrots to a sanctuary, including neglect, death of the owner, disasters, and moving to where parrots cannot readily be accommodated. We are always available to advise owners in their attempts to recapture an escaped parrot. Depending on the situation and geographic location, our Sanctuary can provide assistance in the recapture process. Our Sanctuary provides bird-sitting services, meeting both short-term and long-term boarding requirements. Service fees will be determined on a case-by-case basis, depending on the parrot’s size and requirements. All service fees are required to be paid in advance. These grooming services are done at the Sanctuary and by appointment only between the hours of 9:00 a.m. and 1:00 p.m. daily. Contact the Sanctuary for a fee schedule. Written history of the parrot; e.g., species of parrot, name, age, gender, where and when it was acquired, behavioral problems, preferred diet, medications, reason for relinquishing, etc. Parrot’s physical cage, toys, and food bowls must be included. The Sanctuary’s decision to permanently accept any parrot will be made on a case-by-case basis. As a non-profit facility, the Sanctuary will also ask for a monetary donation to support continued care of the relinquished parrot. Some of the parrots in our Sanctuary are eligible for adoption. This involves both an interview and adoption process, as there needs to be mutual bonding between the parrot and its new owner. Please view our page on Adoption for more information, including an application form. There is an adoption fee for each parrot. This fee is determined on a case-by-base basis.